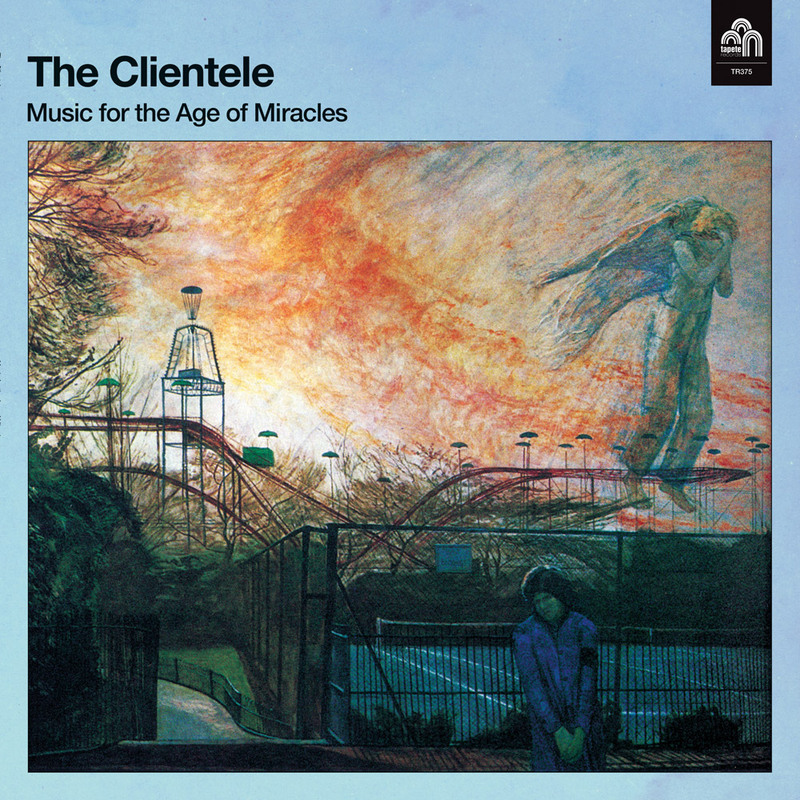 “Music for the age of miracles” sucede ao EP “Minotaur“, de 2010, e é o regresso aos discos dos britânicos The Clientele, o primeiro com selo da Tapete Records. Editado no passado dia 22 de Setembro, a banda explica-o aqui faixa a faixa. It’s the first image – Orpheus next door, the lyre, Lyra the constellation. Radio going up and down the tuning dial without finding a station. Second image is emptiness, the empty house. Two streets back from Harrods, in zone one London, there are no lights, no traffic, no residents. The houses have all been bought as investments and stand empty. There are now streets and streets with no residents in the center of town, and it’s spreading outwards, like some weird sclerosis of the city. I was walking to see a film in the neighbourhood and there was nothing between me and the Brompton Road. I felt like a ghost. The words to Falling Asleep are by war poet Siegfried Sassoon. I first encountered them aged 15 in a GCSE art exam where we were challenged to visualise and paint the poem. I didn’t take the challenge up. He wrote it after the war, and I’ve always been struck by its uneasiness – things on the edge of sight. I went to see a ballet at a studio in Kings Cross. It had no music, just one dancer. There were only 30 or 40 of us in the audience. You could hear her breathe, pant. Her shoes sliding on the floor. She was so close. The windows were open and cold air and the street sounds below floated in. I felt a kind of flowering, a strangeness inside. I went home feeling like a different person. The next image is falling towers: the tower blocks demolished in Elephant and Castle, the twin towers, the tarot card of the tower – the image of catastrophe. When constellation Lyra disappears from the northern hemisphere. The Pleiades are a constellation of seven stars which, strangely, are given the same symbolism in all cultures – women running away, fleeing, departing. I realise this song also sort-of quotes ‘Blueberry Blue’ by the Lemon Pipers as well – saved in my subconscious from a ‘60s bubblegum hits’ tape last listened to 20 years ago. This one is childhood memories, and makes no sense to me. Ant’s arrangement is verging on the manic. Half the band fought to keep it off the album. Kind of a winter song – the bus I used to take to 6th form college, the refectory, smoking outside. Then the North Downs in Sussex – the beginning of a widening of focus from London and the suburbs. The key change at the end really marks an emotional change I think. An extract from the novel I’ve been writing since forever – Orpheus emerging through the suburbs, bit by bit. I got Lupe Nunez-Fernandez to sing a kind of belle dame sans merci fairytale in the background and then realised her words and the narrative basically said the same thing. The recording of the wind is from Dungeness, outside Derek Jarman’s old house. A beautiful place by the sea. The title comes from the A406, a ring road around North London called the North Circular, which provided some inspiration in terms of images of desolation. I read somewhere that XTC tried to make a song with a structure that was meandering and long and winding like a river. I can’t remember where I read it or what song it was about. But I decided to try and do the same. I even know which river I had in mind– the Cuckmere, which leads down from Alfriston to Beachy Head in Sussex. We’d walked it from start to finish in 2015, when I turned 40. I’d also seen it in full flood the December before. There’s a white chalk horse cut into the hill there – a Victorian fraud – but there’s a genuine Neolithic one I visited on the ridgeway in Uffington, not too far away. This one was partly written on long walks, trying to get my six month son to sleep in his buggy. It has that epic sense. I’d sing to him and slowly the song and the words took shape. It started with the first D suspended chord which always made him smile. I guess it’s mostly a song about being a dad. The empty house being filled, the weird sleeplessness, the seasons sneaking up on you. The Sanskrit words are from the dance of Shiva.